During the course of conversation it became clear that the Swedish Prosecution Service could provide documents (via FOIR) about the exact day they received the Julian Assange testimony from Ecuador. Of course they got his testimony on the 14/15th of November 2016 which was in English. What we were discussing was the report produced by Ecuador under Mutual Legal Assistance on the questioning of Julian Assange inside the Ecuadorian Embassy. I would be extremely grateful if you were able to provide me with some information regarding the Julian Assange Interview that took place inside the Ecuadorian Embassy in London on the 14/15 November 2016 for which Swedish Prosecutor Ingrid Isgren was present. 1. Was the interview on the 14/15 November 2016 audio/video recorded? 2. Was the interview audio/video recorded by Mrs Isgren and/or the Swedish policewoman present? 3. Was any video/audio recording available to Mrs Isgren and/or the Swedish policewoman? 4. What was the date that the Swedish Prosecution Service received the report from Ecuador regarding the interview? 5. Did the Swedish Prosecution service receive the report from Ecuador directly or via a different Swedish government department. If there are any related documents that could be disclosed I would be very grateful if you were able to send them to me. In accordance with the agreement between Sweden and Ecuador, the request for legal assistance in criminal cases was granted by Ecuadorian authorities. This meens that the legal assistance was conducted according to Ecuadorian jurisdiction and by an Ecuadorian prosecutor. It also means that Ecuadorian confidentiality legislation applies. Due to the conditions stated by Ecuador, no further information can be provided. The prosecutors received the report from Ecuador on 4 January 2017. The report was then sent for translation. The greater part of the translation was completed on 9 March, and the additional parts a week later. In accordance with the mutual agreement between the two countries, all communication concerning the legal assistance has been carried out via the Swedish Ministry of Justice. The Swedish Prosecution Authority does not answer my first three questions regarding audio/video recording of the Assange interview, on the grounds of Ecuadorian confidentiality legislation. Ms Rosander clarifies that the Swedish Prosecution Service received the ‘Report from Ecuador’ on the 4th of January 2017. Her reply also clarifies that all communication concerning the legal assistance has been carried out via the Swedish Ministry of Justice. This means that The Swedish Prosecution received the ‘Report from Ecuador’ via the Swedish Ministry of Justice. We still do not know when the ‘Report from Ecuador’ was received by the Swedish Ministry of Justice. 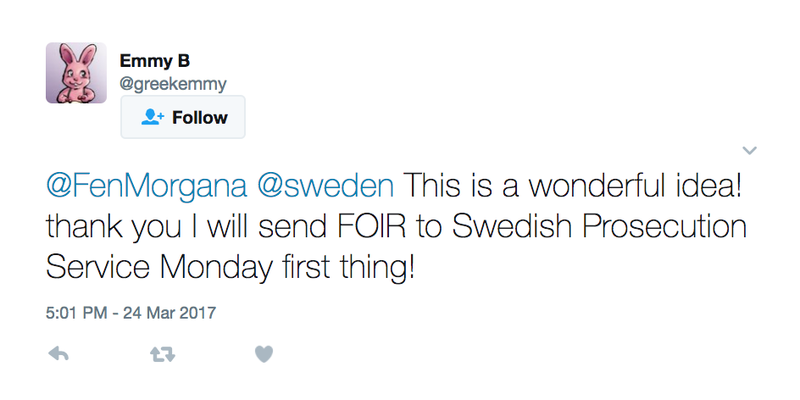 I think it is time for a follow up FOIR directly with the Swedish Ministry of Justice. Thank you for your e-mail dated 28 March 2017. Please be advised that the Swedish Ministry of Justice received the “Report from Ecuador” on 4 January 2017, the report was forwarded to the Swedish Prosecution Authority on the same date. I am afraid that the Ministry of Justice, due to the reasons stated in the e-mail from the Prosecution Authority, cannot provide you with answers to your remaining questions.